My answer is alway this: SEO is definitely something my team and I pay attention to. It’s an ongoing task, making sure that every post is fully optimized, and after 7 years of blogging, it is something I tend to do out of habit. That said, it’s not something I spend a ton of time on. Now, don’t misunderstand me — SEO is important. And it’s also important every blogger has at least a basic understanding of what it is, how it works, and how to optimize your posts. But it’s not something for which you need to take time away from the rest of your life and on which you have to spend the next month learning and focusing (phew!). I promise, it’s not as hard as you think, and you don’t need to be a pro to get your posts ranked in the SERPs (Search Engine Results Pages). It’s simply about following a few basic rules and optimizing your posts the right way. And that “following the rules” part is super important! When it comes to SEO, there are no shortcuts: Google knows what they’re doing, and if you try to trick them, trust me — they’ll catch it so fast it’ll make your head spin. Really, Google’s job is to help people find amazing content. SEO helps Google understand what each page of your site is about so they can help the right people find YOUR amazing content. Now, just so you know: this won’t happen overnight. When you focus on SEO, you are playing the long game, knowing that over time, all those good SEO practices will pay off. But if you apply the right techniques consistently over time, you’ll start seeing yourself move up in the Google rankings — and more and more readers will come your way. 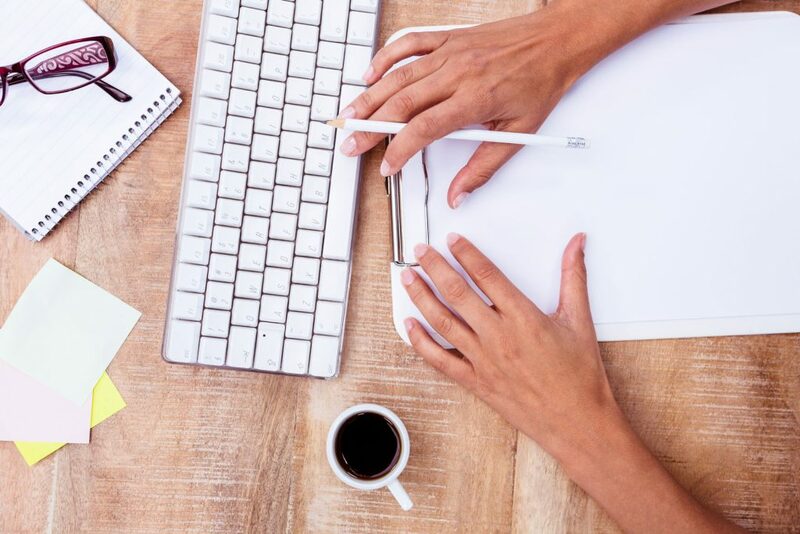 The most important SEO strategy you can implement is to create high-quality content that connects with the people reading it. Remember, it’s Google’s job to deliver the best content to all the Googlers out there. So your goal is to show Google that your content is the absolute best possible result for whatever the search happens to be. No matter how many SEO tricks you have up your sleeve, if you’re not creating amazing content, you won’t get amazing SEO results. Starting with great content is key. Structure is also really important when it comes to SEO. If you try to fit too many different themes and ideas into one post, Google is going to get confused on what your post is actually about. So instead of trying to write about four different themes in one post, take each of those themes and write four different posts. That will make your content more focused and easier to understand from an SEO perspective. You can build off that central theme with subheadings and bullet points, but make sure your central theme is clear in every post you write. Use keywords in your subheadings to reinforce what your post is about and make it easier for Google to understand. Personally, I don’t research keywords. Instead, I choose long-tail keywords that line up with whatever I’m writing about. So, for example, instead of using “cupcake” as my keyword, I would use “how to bake a chocolate cupcake”. It’s a better strategy to optimize for long-tail keywords. Long-tail keywords are more specific, so you’ll get more targeted traffic and more readers looking for exactly what you’re writing about. So how do you choose the right long-tail keywords? So, for example, let’s say you write an article “How to Lose 15 Pounds by Next Week.” If you were looking for a plan to help you drop that kind of weight in the next seven days, what would you search for? Probably something like “how to lose 15 lbs by next week” or “how to lose 15 lbs in 7 days”. So those would be the long-tail keywords you’d want to include in your post. 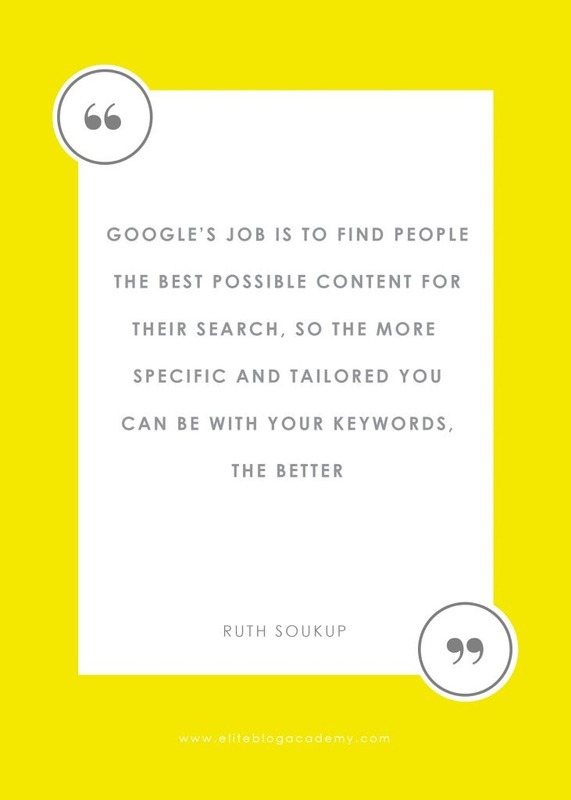 Remember: Google’s job is to find people the best possible content for their search, so the more specific and tailored you can be with your keywords, the better. Now, a quick word of caution: when it comes to keywords, don’t go crazy and try to include your keywords in every other sentence. That’s called “keyword stuffing”, which can actually hurt your SEO rather than help. Pepper your keywords throughout your post in a natural way. A meta description is that little blurb you see underneath a search result when you Google something. It’s basically a sneak preview of what your reader can expect when they click on your post, and it’s super important to drive traffic to your post. The perfect meta description is something that will capture your reader’s attention. Because even if you’re second, third, or fourth on the page, if you have the most compelling description — one that really hooks your reader — yours is the link they’re going to click on. You also want to include your long-tail keyword phrase; not only will it give you a little extra SEO juice, it’ll also remind your reader that your post will give them exactly what they’re looking for. You’ll also want to update your URL slug to highlight your keyword phrase. Your URL slug is the location of a specific post on your blog (or what comes after www.yourblog.com). Most of the time, your URL slug will automatically default to the title of the post, but you’ll want to cut that down and just focus on your keyword phrase. Internal linking is also a great way to boost your SEO. Look for opportunities in your post to link to other, relevant posts you’ve written. The key here is not to overdo it. Only include a link where it naturally works, and don’t try to link every other word. If your post is stuffed with a link every five letters, not only does it hurt SEO, but your readers might get overwhelmed. A good rule of thumb is two to three links per post. And make sure you’re linking your keywords! Linking those keywords is what’s going to help you build up your SEO over time; you’re not going to see any SEO benefit if you link generic words like “click here” instead of your long-tail keywords. In the eyes of Google, broken links are a big no-no, and having them in your posts can really drag down your SEO. Broken Link Checker is a Chrome extension that will check your entire page for broken links and let you know where they are so you can update and fix them. It’s super easy and WAY faster than going through every last post looking for broken links yourself. User experience is a huge factor in how your post will rate on Google. Today, more and more people are using their phones for searches, and as a result, Google is only providing results for pages that are mobile friendly. Make sure that your site is optimized for mobile phones and tablets, and that it provides a great user experience for your readers, no matter where they’re viewing your site. Whenever you use images, it’s really important you optimize them with an alt tag and with a great image description. Not only will this help you on Google, but it will also optimize your posts for Pinterest, which is basically a visual search engine. You’ll also want to optimize your title tags, i.e. the text that appears in the top bar of the browser when people read your post. Include your keyword here to help boost the SEO of the post. Make sure your post has super awesome, high-quality content. Make sure your keyword is in your blog post title, your title tag, and your meta description. And while you’re at it, make sure your meta description is compelling and hooks your reader’s attention. That’s it! If you do those two things, you’ll be well on your way to getting the most out of your SEO, and you can work on implementing all the other tips as you go along. Do you have any SEO tips you’d like to share? Leave your favorite in the comments below! Very helpful post, Ruth!! Question about title tags. I’ve never even heard of those and have no idea how to set those for a post. I’ll do some digging, but thought I’d check with you as well!! Thanks! I’m going through EBA slower than I had hoped (I want to make sure I do it well and not skip! ), but it’s been good so far! Thank you!! This is the best explanation I’ve read about SEO, how to make it work, and all the other (sometimes overwhelming) terminology. This makes it a lot less overwhelming! Hopefully this will help me get over the huge writer’s block I’ve had! 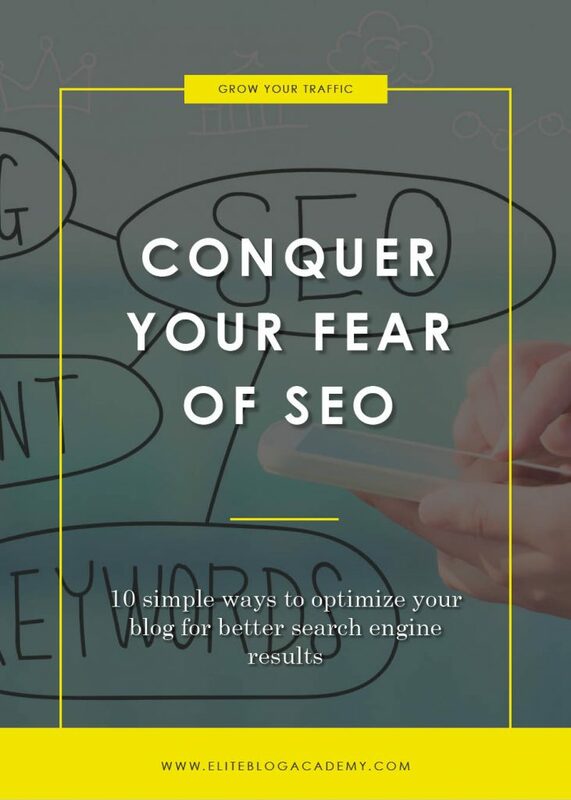 SEO can be scary at first – it was for me anyway. This is a nice neat breakdown but I’ve found adding headers within the text, H2, H3 etc. from the pull-down WYSISG on the left is helpful too. This was very helpful, thank you. As a new blogger SEOs and how they worked was clear as mud but now I can see the fish! This was SO helpful!!! I really needed to hear this today!! About to give up on this SEO thing and then I read this– my hope is renewed! It may not be as hard as it seems! Thanks SO much Ruth! I really appreciate this concise list of SEO tips! Thanks Ruth. I’ve only been blogging a week and this info is vital to my progress. Thanks for this post. I have no clue about optimizing images. Would love more info on that!! Thank-you so much for such a helpful, yet manageable post about such an in-depth, complicated topic! I know some of these tips and have yet to learn and implement others. My only tip to add is to marry a husband who knows about these things (or who will learn them), lol. I am so blessed to have not only a husband and two older sons who know a lot about technology and computers in general, but my husband has a side business doing SEO and hosting websites. I’m very fortunate to have his knowledge, advice and skills to help me by doing some of the jobs that one would normally have to pay someone to do or learn themselves, and by teaching me what I need to know. I’ve already bookmarked this post for future reference, and plan to continue to use it as I grow my blog. Thank you for this helpful post. I’m doing some things right but I still have a lot to learn. I am working on building awesome content and will continue to follow your advice!! Great tips! I took EBA a couple years ago and starting implementing these strategies. It’s taken time but I definitely get more traffic, every day, from Google now. And my Pinterest traffic has soared! Thank you! I love that these tips are simple and completely doable. I don’t need to waste hours researching or installing expensive plugins. Thank you for making it easy and understandable. That’s why I keep coming back for more. We know exactly what works and what doesn’t, and the strategy we teach at EBA will get you earning a lot more money a whole lot faster than if you try to do it on your own. We've been helping students build their dream business since 2014. Over 50 blogging niches are represented by our 10,000+ students in 60 countries around the world. Check out their stories to learn more about Elite Blog Academy®. Have a question? Our support staff is here to help! Contact us by phone or email anytime, and we'll get back to you as soon as possible. Want more from Ruth? Our company is dedicated to helping you create a life you love (not just a blog!) Find out more about what we do on our main website, or connect with us on Instagram!